For the director, see Daniel Alfredson. Daniel Alfredsson (born 11 December 1972) is a Swedish-Canadian retired professional ice hockey player. He spent 18 seasons in the National Hockey League, 17 with the Ottawa Senators and played his final year with the Detroit Red Wings. He signed a one-day contract on December 4, 2014 to retire as a member of the Ottawa Senators. He later signed a part-time job with the Ottawa Senators as an adviser to the General Manager on September 17th, 2015. Alfredsson's #11 jersey number will be officially retired in December 2016. Alfredsson was the longtime captain of the Ottawa Senators; serving from 1999 to 2013. He is considered a leader by example and had been compared to former Detroit Red Wings captain Steve Yzerman in his value during his tenure as captain of the Ottawa Senators. With the Senators, Alfredsson usually played on the first line, which was formerly nicknamed the 'CASH' or 'Pizza' line with centre Jason Spezza and left winger Dany Heatley, before Heatley's trade to the San Jose Sharks. He had traditionally been the fourth forward on the ice in the role of pointman on Ottawa's powerplay. He was one of the league's top two-way players, and he holds the Senators' franchise records for goals (426), assists (682), and points (1108)  with 1,178 games played. He had played for Sweden internationally fourteen times, including the 2006 gold medal and 2014 silver medal winning Olympic teams. He was the 75th player to reach 1,000 career points in the NHL, scoring three goals in a win over the Buffalo Sabres on 22 October 2010. Alfredsson holds an Honorary Degree from Carleton University. Daniel Alfredsson carries the puck up the ice during a 2006 warmup. Drafted 133rd overall in the sixth round of the 1994 NHL Entry Draft, Alfredsson was a serendipitous pick by the Senators. He had been overlooked by many NHL scouts, but one man in Ottawa's front office, John Ferguson, saw the potential and pushed management for his selection. Though largely unheralded entering his first NHL training camp, he would go on to win the Calder Memorial Trophy as rookie of the year in his first NHL season in 1995–96 and was the Senators' representative at the NHL All-Star Game. In 1996–97, he improved on his rookie totals and played in the All-Star Game again. He finished second in team scoring, contributing to the Senators' first modern playoff qualification. Alfredsson missed the beginning of the 1997–98 season due to a contract dispute. On 24 August 1997 he demanded a trade from the Senators after the five-year contract offered to him was $1 million less than that of Alexei Yashin per season. He signed a new deal on 12 October 1997, worth $14 million over four years. After missing the first five games of the season, he was greeted by a standing ovation in his first game back in Ottawa. Alfredsson would later be named the Senators' representative at the All-Star Game for the third consecutive season. During that season, Alfredsson would play in only 55 games, due to the earlier contract dispute and a late season ankle injury. The Senators qualified for the playoffs again and defeated the New Jersey Devils, but lost to the surging Washington Capitals in the second round. Alfredsson would score seven goals in 11 playoff games in 1998. In 1998–99, Alfredsson missed 24 games due to an injury, and was limited to only 11 goals. The club once again qualified for the playoffs, and Alfredsson hoped to have a good postseason, but was limited to one goal and three points in a sweep at the hands of the Buffalo Sabres. The next season, he was named captain of the Senators after Alexei Yashin was stripped of the captaincy for refusing to honor his contract. After two somewhat disappointing seasons, Alfredsson's scoring totals improved, with 21 goals and 59 points in 57 games. In the playoffs, the Senators met the Toronto Maple Leafs in the Eastern Conference Quarterfinals. The Senators would lose the inaugural "Battle of Ontario", although Alfredsson contributed three goals in the six-game series. In 2000–01, Yashin returned to the Ottawa lineup but the team captaincy remained with Alfredsson, who would score 24 goals and 70 points in 68 games. The Senators again met the Maple Leafs in the first round of the playoffs, and Alfredsson was limited to one goal in a four-game series sweep by Toronto. In 2001–02, Alfredsson set a personal best with 37 goals and 71 points in 78 games. In the playoffs, the Senators once again met the now arch-rival Maple Leafs in the second round, where they lost in seven games. Alfredsson led the team in playoff scoring with seven goals and 13 points in twelve games. Alfredsson signed a two-year contract prior to the 2002–03 season. He increased his scoring totals, finishing with 27 goals and 78 points. The club won the President's Trophy that season, despite the organization filing for bankruptcy protection, and qualified for the Eastern Conference Finals before losing to the eventual Stanley Cup champion New Jersey Devils. Alfredsson scored four goals and eight points in 18 games. In 2003–04, Alfredsson finished the season with 32 goals and 80 points in 78 games. The club lost its first-round playoff to Toronto, and Alfredsson was limited to one goal and three points in the seven-game series. Mid-season, Alfredsson signed a five-year contract extension with the Ottawa Senators. Like many NHL players, Alfredsson played for a European team during the 2004–05 NHL lockout. He returned to Sweden to play for Frölunda HC, the team he had played for prior to beginning his NHL career. He played on an all-NHL line with P. J. Axelsson and Samuel Påhlsson, helping the club win the Swedish Championship. Alfredsson was a major contributor during the playoffs, scoring 12 goals and 18 points in 13 games. On 5 October 2005, opening night for the 2005–06 NHL season, the Senators played the Maple Leafs, with the newly acquired Dany Heatley playing on the top line with Jason Spezza and Brandon Bochenski. The Senators were down by a goal with five minutes remaining in the third period, when Alfredsson, replacing Bochenski on the top line, scored the tying goal. This line combination would remain intact, and became known as the 'CASH line'. Later in the same game, Heatley and Alfredsson scored the first goals in a regular season NHL shootout when they scored against Leafs goalie Ed Belfour for a 3–2 victory. With Alfredsson scoring in the shootout, he became the first captain in the NHL history to do so. Alfredsson and Heatley's sticks were subsequently sent to the Hockey Hall of Fame. 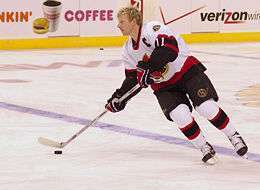 Alfredsson capped off the 2005–06 regular season with a career high 103 points (43 goals and 60 assists) tied for first on the Senators along with Heatley. Perhaps the best game of his NHL career took place on 3 November 2005 against the longtime rival Buffalo Sabres, in which he scored a then career-high four goals and six points. After a disappointing 2006 playoffs and poor play to start the season, Alfredsson became the subject of trade rumors from the beginning of the 2006–07 season. He improved his game, attributing the reversal in part to a change in skates, and had a six-game scoring streak soon after. On Saturday, 23 December 2006, against the Philadelphia Flyers, he notched his 600th career point, scoring two goals and adding an assist. In the 2007 playoffs, Alfredsson was the Senators' leading scorer with 14 goals and 22 points in 20 games. His leadership and strong play helped the Senators as they advanced past the Pittsburgh Penguins, the New Jersey Devils, and the Buffalo Sabres advancing to the Stanley Cup Finals for the first time in modern franchise history. He became the first European-born-and-raised captain to lead his team to the finals. When presented with the Prince of Wales Trophy, he posed while touching the trophy, which many hockey players consider a form of bad luck. Alfredsson was arguably Ottawa's best player in the Stanley Cup Finals, which the Senators ultimately lost to the Anaheim Ducks in a five-game series. In a controversial incident in game four, an Alfredsson slap shot hit Ducks captain Scott Niedermayer at the end of the second period, leading to speculation that Alfredsson intended to injure Niedermayer. Alfredsson dismissed the notion, saying that he had glanced up at the clock to see if he had time to move in for a better shot, and then quickly fired in the heat of an important game. Along with the rest of the Senators, Alfredsson's 2007–08 season was marked by highs and lows. On 24 January 2008, he scored three goals and four assists in an 8–4 victory over the Tampa Bay Lightning., setting the Senators' record for most points in one game. It vaulted him into the NHL scoring lead at the All-Star break. He was named NHL 'Player of the Week' and its 'First Star'. Alfredsson and his linemates, Heatley and Spezza, were named to the Eastern Conference All-Star game roster, although Heatley would not play due to injury. Injuries reduced Alfredsson's playing time and effectiveness in the latter half of the season. First, Alfredsson suffered a hip pointer injury, and on 3 April 2008, Mark Bell of the Maple Leafs hit him with a shoulder that left Alfredsson on the ice, unable to get up for several minutes. He missed the final game of the regular season and the beginning of the playoffs. He had played in every modern Senators playoff game up to that point. On 14 April 2008, with the Senators trailing 2–0 in their playoff series to the Pittsburgh Penguins, Alfredsson made his return in game three of the series, four weeks earlier than initially expected. He was welcomed with a lengthy standing ovation at Scotiabank Place. However, the Senators gave up four unanswered goals (three in the third period) to lose the game 4–1. The Senators lost game four 3–1. Afterwards, in an interview on CBC, he admitted he had been playing with a ruptured medial collateral ligament. In October 2008, Alfredsson underwent arthroscopic surgery on his right knee to remove a bone chip and returned less than a week later. On 30 October 2008, Alfredsson agreed to a four-year contract extension with Ottawa worth $21.6 million. The contract, intended to allow Alfredsson to finish his playing career with the Senators, included a no-movement clause. The 2008–09 season was a disappointing one for both Alfredsson and the Senators. The team failed to make the playoffs, and Alfredsson registered only 24 goals and 74 points in 79 games. On 8 July 2009, Alfredsson became the longest serving active captain in the NHL, as former Montreal Canadiens captain Saku Koivu signed with the Anaheim Ducks and former Colorado Avalanche captain Joe Sakic announced his retirement. The 2009–10 season saw his point total dip again, as he scored only 20 goals and had 71 points in 70 games. On 6 April, Alfredsson reached an important milestone, playing in his 1000th regular season game. Even though the Senators lost to Pittsburgh in the first round, Alfredsson still scored two goals and added six assists to lead the team in scoring (tied with Matt Cullen). He later admitted he had been bothered by a sports hernia since February, which could explain his reduced effectiveness in the last weeks of the season and the playoffs. During the 2010–11 season, Alfredsson recorded his 1,000th career NHL point in a victory over the Buffalo Sabres on 22 October 2010. At season's end, Alfredsson underwent back surgery and was released from hospital the same day. At a 14 June 2011 news conference introducing new Senators' head coach Paul MacLean, Alfredsson stated that the surgery went well and that he was moving around fine. Alfredsson began the 2011–12 season healthy, but was diagnosed with a concussion for the first time in his career after receiving a blow to the head from New York Rangers forward Wojtek Wolski on 29 October 2011. He returned on 11 November after missing five games, in a game against the Buffalo Sabres. On 30 December 2011, Alfredsson scored his 400th career goal, the game winner in overtime, versus the Calgary Flames. Widely assumed to be a candidate to be moved to a Stanley Cup contender at the 2012 trade deadline, Ottawa's strong play resulted in Alfredsson not being placed on the trade market. "I was just really happy we didn’t have to make that decision", said Alfredsson of the possibility of leaving Ottawa. In the 2012 NHL All-Star Game held at Scotiabank Place, Alfredsson was captain of "Team Alfredsson", scoring twice within one minute and 31 seconds in a 12–9 loss to "Team Chára". In the first round of the 2012 NHL Playoffs, Alfredsson and the Senators were eliminated by the first-place New York Rangers in seven games. Speculation was rampant during early summer of 2012 that Alfredsson would announce his retirement, but on 31 July he confirmed that he would be returning for his 17th season with the Senators. The lockout shortened 2012–13 season was a successful one for Alfredsson and the Senators. The team made the playoffs despite losing several key players to injury for extended periods, and defeated the rival Montreal Canadiens in the first round. Alfredsson was third in team scoring during the regular season with 10 goals and 16 assists in 47 games, and he led the Senators in scoring through the playoffs with four goals and 10 points in 10 games. At season's end there was again speculation that Alfredsson might announce his retirement. On 28 June 2013, GM Bryan Murray confirmed that he had been informed by agent J. P. Barry that Alfredsson "is committed to play next year for the Senators". While Alfredsson negotiated a new contract with Ottawa, Boston Bruins' GM Peter Chiarelli reached out to him in an attempt to gauge his interest in signing with Boston. Chiarelli attempted to convince Alfredsson that Boston could be a good destination for an older player looking to win a Stanley Cup prior to retirement. The long-time Ottawa captain signed a one-year, $5.5 million contract with the Detroit Red Wings on 5 July 2013. Alfredsson's Ottawa teammates were taken aback by the news. Alfredsson phoned Chris Phillips so he would not hear the news at the same time as everyone else; Phillips said he was shocked. Marc Methot said many teammates were caught off guard. "We all were pretty adamant that he was going to return because he is grounded in this city (Ottawa) and so well-loved that everyone figured something would work out", said Methot. Ex-Senators' coach Jacques Martin, now a hockey analyst on TVA Sports, compared Alfredsson's departure to Ray Bourque's decision to move to the Colorado Avalanche to win a Stanley Cup. Alfredsson confirmed a day later that his decision to leave Ottawa was motivated by a desire to win a Stanley Cup prior to retirement. "I had not won a Stanley Cup and that’s a big priority for me," Alfredsson said. He later explained that his departure from Ottawa was due to a contract impasse, though Senators' general manager Bryan Murray had expected Alfredsson to remain in Ottawa. Alfredsson returned to Ottawa for the first time with the Red Wings on 1 December 2013, and was greeted with a video tribute and loud cheers from the Canadian Tire Centre crowd. He also scored an empty net goal in the Red Wings victory. 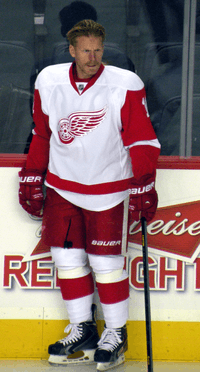 The 41-year-old posted 18 goals and 49 points during his only season with the Detroit Red Wings during the 2013–14 season. Back problems kept Alfredsson from attending training camp and starting the 2014–15 season. On 27 November 2014, Alfredsson announced to Swedish press that he had retired as a player. On 4 December 2014, Alfredsson signed a one-day contract to officially retire as a member of the Ottawa Senators. Alfredsson took part in the pre-game warm-ups, and took the ceremonial face-off as the Senators faced the New York Islanders. During Alfredsson's career with the Ottawa Senators, he played in 1,178 games, had 426 goals, 682 assists and 1,108 points, all franchise records. However, Chris Phillips broke Alfredsson's games-played record two months later. At the 2006 Olympics, Alfredsson set personal highs in goals (5), assists (5) and points (10) and played on the second line with Mats Sundin and Henrik Zetterberg. After an injury to Peter Forsberg, Alfredsson took Forsberg's spot as the alternate captain, along with Captain Sundin and defenseman Nicklas Lidström. Alfredsson was named captain of Team Sweden for the first time at the 2012 IIHF World Championship. Alfredsson married longtime girlfriend Birgitta (née Backman) on 31 July 2004. They are the parents of four sons, Hugo, Loui, Fenix and William Erik. The family resides in Ottawa and Särö, Sweden. Alfredsson's parents are Hasse and Margareta Alfredsson. His younger brother Henric Alfredsson played with the Ottawa 67's junior team as a 19-year-old during their 1999 Memorial Cup-winning season. Henric decided to stay in Ottawa after his junior hockey career with the 67's was complete, and now works for the Ottawa Police Service. On March 5, 2015, Alfredsson was presented with The Key to the City by Ottawa Deputy Mayor Bob Monette. Mayor Jim Watson was recuperating from a broken pelvis suffered in a snowmobiling accident and was unavailable. The Key to the City is the city's highest honour, reserved only for the people who make the greatest impact on Ottawa residents. The honour was in recognition not only of Alfredsson's accomplishments with the Senators, but also for his off-ice leadership and advocacy with the Ottawa Senators Foundation, the Royal Ottawa Foundation for Mental Health, and the Boys and Girls Club of Ottawa. Alfredsson officially became a naturalized Canadian citizen at a special ceremony at the 2016 World Cup of Hockey on September 20, 2016. On June 7th, 2016 Alfredsson received an honorary degree from Carleton University for his outstanding contributions to Canadian hockey and, in particular, his commitment to the community through philanthropic efforts that include mental health awareness and advocacy for equality of athletes, regardless of their sexual orientation. Holds the Senators record for regular season goals, assists and points. Holds the Senators record for highest +/- rating in a season, set in 2006–07 with +42. Holds the Senators record for most points in a regular season game, set in 2007–08, with 3 goals and 4 assists for 7 points. Holds the Senators playoff records for most games played, goals, assists and points. Scored the 300th goal of his career on 10 November 2007. Recorded the 500th assist of his career on 24 January 2008. Played in his 1000th NHL game (all with the Ottawa Senators) on 6 April 2010 against the Florida Panthers. Reached the 1,000 point milestone with a hat-trick against the Buffalo Sabres on 22 October 2010. Scored his 400th career goal in OT against the Calgary Flames on 30 December 2011. Finished 2nd in Lady Byng Memorial Trophy voting in 2003–04. Finished 3rd in Selke Trophy voting as the best defensive forward in 2005–06. Finished 4th in Lady Byng Memorial Trophy voting as the NHL's most gentlemanly player in 2005–06. Finished in the top 3 in voting for the Bill Masterton Memorial Trophy in 2011–2012. Scored the first shootout goal in NHL history during the 2005–06 season. Led the Swedish Gold Medal winning Olympic hockey team in scoring (with 5 goals and 5 assists in 8 games played) during the 2006 Winter Olympics in Torino, Italy. 10 April 2010 was officially "Daniel Alfredsson Day" in Ottawa, declared in honour of his 1,000th NHL game. Was the first European-born and trained captain to lead his team to the Stanley Cup Finals in 2007. Improved his point totals for six consecutive seasons from 1998–99 to 2005–06 inclusive, a franchise record. Appears on the cover of the Swedish version of the EA Sports NHL 09 video game. Won the first major award in modern Senators history when he was awarded the Calder Memorial Trophy in 1995–96. He has played in 119 of the 121 playoff games of the modern Senators. He led the league in goals during the 2006–07 playoffs and tied linemates Jason Spezza and Dany Heatley with 22 points to lead the league in playoff scoring. Daniel Alfredsson will become the first player in modern Senators history to have his jersey number retired in December 2016. ↑ Garrioch, Bruce (7 July 2013). "Daniel Alfredsson's departure examined by Bruce Garrioch". Ottawa Sun. Retrieved 7 July 2013. ↑ "Alfredsson and Senators agree to four-year deal". TSN.ca. 30 October 2008. Retrieved 30 October 2008. ↑ "Alfie is ready to play". sportsnet.ca. 10 November 2011. Retrieved 13 November 2011. ↑ "ENROTH STANDS TALL AGAIN, SABRES DOMINATE SENATORS". tsn.ca. 12 November 2011. Retrieved 13 November 2011. ↑ tsn.ca Staff. "Daniel Alfredsson #11 - RW". The Sports Network. Retrieved 28 June 2013. ↑ tsn.ca Staff. "SENATORS CAPTAIN ALFREDSSON PLANNING ANOTHER NHL SEASON". The Sports Network. Retrieved 28 June 2013. ↑ Garrioch, Bruce (3 July 2013). "Bruins reach out to Daniel Alfredsson". Ottawa Sun. Retrieved 3 July 2013. 1 2 3 4 Garrioch, Bruce (6 July 2013). "Chris Phillips and Ottawa Senators teammates stunned by news of Daniel Alfredsson's departure". Ottawa Sun. Retrieved 6 July 2013. ↑ Whyno, Stephen (6 July 2013). "Daniel Alfredsson leaving Senators for chance to win Stanley Cup with Red Wings". The National Post. Retrieved 6 July 2013. ↑ Nicks, Erin (15 August 2013). "Alfredsson: Contract impasse led to Ottawa departure". NHL.com. Retrieved 14 September 2013. ↑ NHL.com (15 August 2013). "Senators GM looking ahead after Alfredsson". NHL.com. Retrieved 14 September 2013. ↑ Stevenson, Chris (4 December 2014). "Alfredsson announces retirement after 18 seasons". NHL. Retrieved 4 December 2014. ↑ "Newest Alfredsson has a name". Ottawa Citizen. 23 May 2011. Retrieved 18 June 2011. ↑ The Canadian Press (14 June 2013). "Senators' Paul MacLean wins Jack Adams award as top coach". cbc.ca. Retrieved 14 June 2013. ↑ Ottawa Citizen (7 June 2016). "Alfredsson receives Honorary Degree from Carleton University". ottawacitizen.com. Retrieved 28 August 2016. ↑ TSN.ca Staff (8 April 2010). "REPORT: MAYOR TO PROCLAIM SATURDAY 'ALFREDSSON DAY' IN OTTAWA". TSN.ca. Retrieved 10 April 2010. ↑ The Canadian Press (9 June 2008). "FLAMES' PHANEUF TO GRACE THE COVER OF 'NHL 09'". TSN.ca. Retrieved 10 June 2008. Eliteprospects - Listed as "Retired"